Uniondale, New York 11553, U.S.
Nassau Veterans Memorial Coliseum (commonly known as Nassau Coliseum) was a multi-purpose indoor arena in Uniondale, New York. It was open from 1972 through 2015. The Coliseum is located approximately 19 miles (31 km) east of New York City on Long Island. Opened in 1972, the Coliseum occupies 63 acres (25 ha) of Mitchel Field, site of a former Army and Air Force base. The facility was located in the Town of Hempstead, within the Uniondale 11553 ZIP code. The Coliseum was used for sporting events, concerts, large exhibitions and shows of various kinds, as well as trade shows — 44,000 square feet (4,100 m2) at the main arena, 60,000 at the Expo Center. 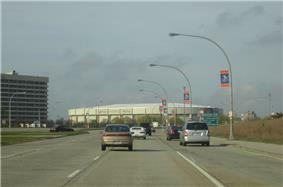 The arena served as the home for the New York Islanders ice hockey team from 1972 to 2015 and the New York Nets basketball team from 1972 to 1977. The Coliseum originally had a capacity of 13,000 to 15,000 depending on the event, and in the early 1980s the maximum capacity was increased to around 18,000. The Coliseum seats 16,170 for hockey, up to 18,100 for concerts and 17,686 for boxing. The Coliseum was home to the New York Nets of the American Basketball Association, and later the National Basketball Association, from 1972 to 1977. 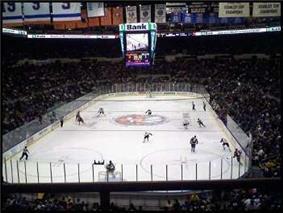 The first event held at the Coliseum was a Nets game against the Pittsburgh Condors on February 11, 1972. The Nets won two ABA Championships in the Coliseum, with Hall of Famer Julius Erving headlining the team. In 1973-74 the Nets defeated the Utah Stars in 5 games to capture their first title. The Nets then captured the final American Basketball Association Championship in 1976, defeating the Denver Nuggets in 6 games. Following the 1976 season the Nets joined the National Basketball Association as part of the ABA-NBA merger. After their first season in the NBA, the Nets franchise moved to New Jersey. The New Jersey Nets played four seasons at the Rutgers Athletic Center before completion of a new arena at the Meadowlands Sports Complex. The Coliseum also hosted the New York Arrows and later the New York Express of the original Major Indoor Soccer League. In Eastern College Athletic Conference (ECAC) in 1978, 1979, 1980, and 1981. It also has hosted first- and second-round games of the NCAA Division I Men's Basketball Tournament in 1982, 1994, and 2001. The New York Sets of the World Team Tennis league played their first match at Nassau Coliseum on May 7, 1974, and won the WTT championships in 1976. The team changed its name to the New York Apples for the 1977 season, and began playing at Madison Square Garden and the Felt Forum and repeating as champions. The New York Raiders, intended by the fledgling World Hockey Association to be their flagship franchise, was initially slated to play in the brand-new Nassau Coliseum. However, Nassau County didn't consider the WHA a professional league and wanted nothing to do with the Raiders. Nassau County retained William Shea to get a National Hockey League (NHL) team to play in the new building. The NHL responded by hastily awarding a franchise to Long Island—the New York Islanders—which forced the Raiders to play in Madison Square Garden, in the shadow of the New York Rangers. On February 8, 1983, the arena hosted the 35th National Hockey League All-Star Game, during which Wayne Gretzky scored four goals in the third period and was honored as the game's most valuable player. On October 7, 1972, the first Islanders game in Nassau Coliseum was played as the Atlanta Flames visited the Islanders. Flames forward Morris Stefaniw scored the first NHL goal in the building at 6:56 of the first period, while Ed Westfall scored the first goal for the Islanders, as the Flames won the game 3-2. The Coliseum was home to the New York Saints of the National Lacrosse League from 1989 to 2003, but the Saints became an inactive team in 2004. In 2007, it was home to four of the New York Titans National Lacrosse League team's eight home games (along with Madison Square Garden). 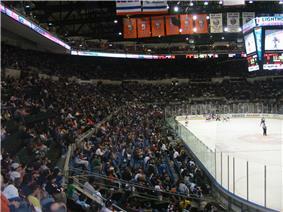 The Nassau Coliseum hosted minor league hockey prior to the awarding of the Islanders franchise, an event that was brought back in 2005, when the Islanders-affiliated Bridgeport Sound Tigers of the American Hockey League (AHL) played two "home" games at the Coliseum in the absence of National Hockey League (NHL) hockey due to the 2004–05 NHL lockout. On April 17–18, 2009, the Sound Tigers played two of their home playoff games against the Wilkes-Barre/Scranton Penguins at the Coliseum due to a scheduling conflict at the Sound Tigers‍ '​ regular home, the Arena at Harbor Yard in Bridgeport, Connecticut. In 2000 and 2005, the Professional Bull Riders brought their Built Ford Tough Series (originally Bud Light Cup) to the Coliseum. On February 24–25, 2006, Nassau Veterans Memorial Coliseum hosted the 44th NYSPHSAA Wrestling Championships. It's just the third time the annual event has been held on Long Island. Selling 17,755 tickets over three sessions, it broke (and still holds) the NYSPHSAA wrestling tournament attendance record. On April 25, 2015, the final Islanders game at Nassau Coliseum was held, Game 6 of their first round playoff series against the Washington Capitals. The game was won by the Islanders 3-1, forcing a Game 7 in Washington. The Islanders' Cal Clutterbuck scored the final NHL goal at the Coliseum, an empty net goal that put the Islanders up 3-1 at 19:07 of the 3rd period. However, the Islanders were denied entry into the second round of the playoffs as they lost Game 7 of the series to the Capitals in Washington two nights later, thus making Game 6 the final major-league sporting event to be held at the Coliseum. On May 25, 2015, it was announced by the Chairman of WWE, Vince McMahon, in an address to the crowd before its flagship show WWE Raw that it would be the final WWE event held at the Coliseum. Elvis Presley performed 4 sold out concerts at the Nassau Coliseum on June 22, 23, & 24, 1973. His last Coliseum appearance was on July 19, 1975. Six days following Presley's death, a summer tour was scheduled to begin at the Coliseum on August 22, 1977. Tickets for that show have become collectors items. David Bowie performed a radio broadcast from there during his 1976 Station to Station Tour. A heavily circulated bootleg of the concert saw official release in 2010 as part of the Station To Station Deluxe Box Set. Queen played at the Coliseum in February 1977 during their headlining US tour. Film footage of the band's performance of "Tie Your Mother Down" at the venue was used in the song's promotional film. Led Zeppelin played three nights at the Nassau Coliseum on their 1975 North American Tour. During the second night, February 13, Ronnie Wood of the Faces and The Rolling Stones joined the band for a rousing rendition of "Communication Breakdown." High quality soundboard recordings of the band's performances on February 13 and 14 have recently surfaced on bootlegs. The Coliseum was one of only two venues in the United States where Pink Floyd mounted their limited run of shows for The Wall Tour. Five concerts were performed from February 24 through 28, 1980 one of which was filmed and only appeared as an underground tape. In August 1988, they recorded and filmed the Delicate Sound of Thunder over four nights at the Coliseum. Live on Long Island 04-18-80 by The Marshall Tucker Band was the final concert of the original lineup and final recording of bassist and founding member Tommy Caldwell, occurring just ten days before his death in an automobile accident. Tommy Caldwell is pictured on the album cover. The Coliseum album was the first to feature a complete concert recording from the original band. However, the album wasn't released until 26 years later. The band was touring in support of their album Tenth at the time of the recording and features the songs "It Takes Time" and "Cattle Drive" from that release as well as classics such as "Heard It in a Love Song", "Searchin' for a Rainbow" and "Can't You See". Billy Joel has a "retired number" banner hanging from the rafters, along with those of Islander greats, to commemorate his many sold-out Coliseum shows. His "retired number" is 69. One of Joel's concerts from his 1982 tour at the Coliseum was recorded for a 1983 HBO concert special and VHS release, Billy Joel: Live From Long Island. Bruce Springsteen played three shows at the end of 1980. A number of songs from these shows were used on his 1986 live album, Live/1975–85. Supertramp performed at the Coliseum on their final tour with Roger Hodgson in 1983 in support of their ...Famous Last Words... album. The 1986 live album Finyl Vinyl by Rainbow features a rendition of the song "Can't Happen Here" which was recorded at Nassau Coliseum in 1981. The 1987 home video Cliff 'Em All features a rendition of the song "Master of Puppets" by Metallica, filmed at Nassau Coliseum on April 28, 1986 (while the band was opening a show for Ozzy Osbourne). 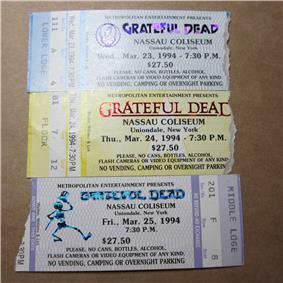 Both The Grateful Dead and Phish frequently played the Coliseum, concerts yielding live albums in both cases: Go to Nassau by the Dead; and three installments of the Live Phish Series — 4-2-98, 4-3-98 and 2-28-03. Genesis' performance at the Coliseum on November 29, 1981 (during the band's Abacab Tour) was recorded and filmed for the band's Three Sides Live album and concert video plus radio broadcast. Frank Zappa played his last ever U.S. show on March 25, 1988 at the Coliseum. He was joined onstage by his son, Dweezil Zappa, for the concert's encores. Pink Floyd performed between the 19th of August and the 23rd of August, 1988, on their A Momentary Lapse Of Reason Tour. On March 1990, the country supergroup The Highwaymen performed at the Coliseum. This performance was recorded and was released on VHS in 1991. On June 11, 12, and 13, 1990, Madonna performed three sold-out shows at Nassau Coliseum on her Blond Ambition World Tour. The inside sleeve to Morrissey's 1992 album Your Arsenal was shot at a performance at the Coliseum on November 11, 1991. Post 2000, scenes for the 2007 movie Music and Lyrics starring Hugh Grant and Drew Barrymore were filmed at the arena. On February 6 and 7, 2008, The Spice Girls performed two sold-out shows during their Return of the Spice Girls Tour. It was their first performance in the New York metropolitan area as a five-piece act. In 2012, Madonna used the arena to rehearse her MDNA World Tour. On July 19–20, 2014, the Global RallyCross Championship raced at the Nassau Coliseum parking lot. The Coliseum was the second-oldest arena in active use by a National Hockey League team (after nearby Madison Square Garden), and until the return of the Winnipeg Jets to the league at the 15,004 seat MTS Centre in Winnipeg, was the smallest arena in the NHL by total seating capacity. The arena has been considered obsolete for many years, and various Islanders owners have been trying to replace the arena for over ten years. Team and county officials announced in 2004 a plan called The Lighthouse Project to renovate the Coliseum. The centerpiece of the project was a 60-story tower designed to look like a lighthouse. Other plans include new housing, athletic facilities, a minor league baseball stadium, restaurants, and a hotel. The project would also add trees, water and other natural elements to the area. On August 14, 2007, Islanders owner Charles Wang and the Lighthouse Development Group partnered with Rexcorp to create a new plan, changing the overall project scale. The 60-story "lighthouse" evolved into two 31-story buildings connected with a footbridge at the top. The project as a whole was transformed from a simple renovation of the Coliseum property into a 150-acre (0.61 km2) transformation of surrounding properties. Plans called for more 2,000 residential units (20% affordable housing), a hotel, a convention center, a sports technology center, 500,000 square feet (46,000 m2) of retail space, and a sports complex adjacent to the renovated Coliseum. The overall project was slated to cost roughly $3.75 billion. Construction was not planned to begin until at least mid-2009. Nassau County approved the entire Lighthouse Project in 2006 on a 16–2 vote, and the Draft Environmental Impact Statement was completed after a state-mandated environmental review. The Lighthouse Project was then expected to go before the Town of Hempstead for approval on a change in land zoning. However, the approval was never granted. After the October 2009 deadline passed, the Long Island Press reported the cancellation of the Lighthouse Project. Wang has denied the report. In May 2010, Mets COO Jeff Wilpon had discussions with Wang about constructing a new arena for the Islanders near Citi Field. Wilpon has also discussed the possibility of buying the Islanders. In June 2010, the website FanHouse reported that Jeff and Fred Wilpon, the owner of the Mets, began working with real estate firm Jones Lang LaSalle (who also worked on the most recent renovation of Madison Square Garden) on a feasibility study of a new Islanders arena in Queens. 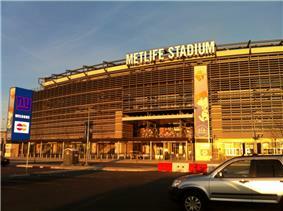 However, a source from Newsday indicated that the FanHouse report was not true. There were also reports that businessman Nelson Peltz wanted to buy the Islanders and move them to the Barclays Center in Brooklyn. 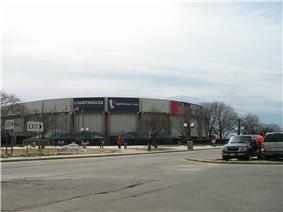 On July 12, 2010, Town Supervisor Kate Murray (R-Hempstead) announced an “alternate zone” created for the Nassau Veterans Memorial Coliseum property, downsizing the original Lighthouse Project to half its proposed size and making the project, according to Nassau County Executive Edward Mangano and the developers, "economically unviable for both the developer and owner of the site." From this point, the Lighthouse Project would no longer be pursued by Wang, Mangano and the developers. On May 11, 2011, the Islanders and Nassau County executives announced that county residents would vote on a referendum for approval of a $400 million public bond issue for a new plan to replace the Coliseum. The plan including the construction of a new $350 million arena as well as a $50 million minor league baseball ballpark nearby, and was presented by Wang as a last-ditch effort to keep the Islanders on Long Island. However, voters in the Nassau County rejected a proposal by a 57% to 43% margin on August 1, 2011. On October 24, 2012, the Islanders announced the team would move to the Barclays Center in Brooklyn following the expiration of their lease after the 2014-2015 season. The Islanders played what would be their final game at the Coliseum on April 25, 2015, beating the Washington Capitals 3-1 in game 6 of the first round of the playoffs against the Washington Capitals forcing a Game 7, held in and won by Washington, ending the Isles' run at the Coliseum; in Game 6 Cal Clutterbuck of the Islanders scored the final NHL goal in the building, an empty netter at 19:07 of the third period. Forest City Ratner's proposal to renovate the Coliseum, showing a metal cladded facade similar to that of the Barclays Center. Not long after the Islanders announced their move to Brooklyn, Forest City Enterprises, the owner of Barclays Center, was chosen to perform a study on development possibilities for the Nassau Coliseum site. A request for proposal was issued as a result of this study to transform the arena into a smaller sized venue and its surrounding parking lot into an entertainment hub with theaters, sports bars, retail, and more. Four competing proposals were submitted in May 2013, and two finalists were selected by Nassau County Executive Edward Mangano in July 2013, one from a group led by Forest City Ratner, and another from a group led by the Madison Square Garden Company. Ratner's proposal called for a reduction of the Coliseum’s seating capacity to 13,000 and an aesthetic revamp of the arena’s interior and concrete facade designed by SHoP Architects, the firm which designed the Barclays Center, which would cost the group approximately $89 million. As part of his bid, the Islanders would play 6 games per season in the arena, the Brooklyn Nets would play one exhibition game, and a minor league hockey team would call the arena home. By contrast, MSG's proposal called for capacity which could scale from a 14,500-seat major concert venue to a 1,700-seat theater and the addition of glass elements to the facade, as well as a renovated interior. MSG's proposal would possibly bring the New York Liberty, the Erie BayHawks and a minor league hockey team to the arena. On August 15, 2013, it was announced that Forest City had won the bid for the renovation of the Nassau Coliseum and its surrounding property, pending approval from the Nassau legislature and zoning changes from the Hempstead town government. The bid was approved unanimously by the Nassau legislature on September 24, 2013. On April 24, 2015, it was announced that Billy Joel would perform the final concert at the arena on August 4, 2015, before the start of the renovation. In July 2008, Joel's performances at Shea Stadium were that venue's final live concert event before its demolition. 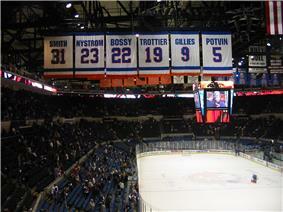 The New York Islanders' retired numbers and other banners raised inside the Coliseum. Coliseum before an Islanders game. ^ a b c Hirshon, Nicholas (2010). 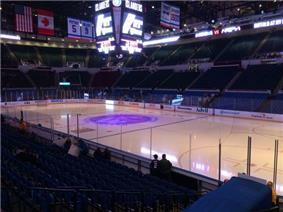 Nassau Veterans Memorial Coliseum. Images of America. Charleston, SC: Arcadia Publishing. ^ a b Koppett, Leonard (February 11, 1972). "Nets to Open Nassau Coliseum Tonight in Game With Condors". ^ a b "New York Nets". Remember the ABA. Retrieved 2013-02-22. ^ Moran, Malcolm (March 8, 1982). "Highly-Rated Teams to Hit the Road for N.C.A.A. Tourney". ^ Wallace, William N. (March 14, 1994). "Big East Turns Draw Into Festival". ^ Longman, Jere (March 15, 2001). "Once Lowly, Sankes and Holy Cross Bounce Back". The New York Times. Retrieved 2010-07-01. ^ Sprechman, Jordan; Shannon, Bill (1998). This Day in New York Sports. Sports Museum Press. p. 128. ^ Kornheiser, Tony (December 17, 1976). "Sets Change to a Juicier Nickname". ^ Mifflin, Lawrie (February 9, 1983). "Gretzky Scores 4 in Third to Lead Campbell". ^ "NYSPHSAA Wrestling Championships - Tournament History". Nysphsaawrestling.com. Retrieved 2013-02-22. ^ Compton, Brian. "Islanders stay alive with Game 6 win against Capitals". NHL.com. NHL. Retrieved 28 April 2015. 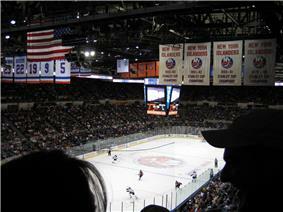 ^ a b "Good, Bad and Optimistic Make Their Peace With Nassau Coliseum". The New York Times. Retrieved 28 April 2015. ^ "Frank Zappa Gig List: 1988". ^ "Seating Capacities of the 30 NHL Arenas". ^ Young, Monte R. (September 28, 2004). "Visions of $200M Renovation". ^ a b Moore, Elizabeth (March 10, 2009). "Even Without Stimulus, Nassau Committed to Lighthouse". ^ Rieber, Anthony (March 4, 2009). "Papers Reveal Isles Will Leave Without Lighthouse OK". ^ Martino, Jr., Michael (2009-10-14). "Press Exclusive: Plug Is Pulled On Lighthouse". ^ "Wang: Lighthouse Project still on". ^ Mennella, Dan (2010-05-12). "Mets, Isles talk about arena near Citi". MLB.com. Retrieved 2010-05-12. ^ Botta, Christoper (2010-06-14). "Mets Owners Working With Real Estate Firm on Queens Arena for Islanders". ^ "Report: Source refutes firm's hiring". ^ Hirshon, Nicholas (2011-01-07). "Brooklyn-Queens battle for the Islanders team brewing". ^ "Zoning move cuts Lighthouse in half". LIHerald.com. 2010-07-12. Retrieved 2014-01-01. ^ "Last chance for Islanders? Arena plans rest on Aug. 1 vote". Yahoo Sports. ^ Gretz, Adam (October 24, 2012). "New York Islanders will move to Brooklyn in 2015". 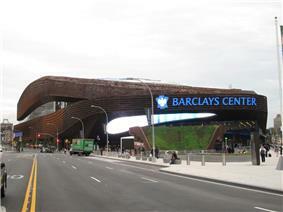 ^ "Barclays Center Developer To Conduct Study On Nassau Coliseum's Future". Sports Business Daily. November 12, 2012. Retrieved August 16, 2013. ^ "Four Developers Submit Proposals For Nassau Coliseum; Jay-Z Part Of Ratner's Bid". Sports Business Daily. May 3, 2013. Retrieved August 16, 2013. ^ Calder, Rich (May 3, 2013). "A new dream Coliseum". New York Post. Retrieved August 16, 2013. ^ "Ratner, MSG picked as Coliseum finalists". The Island Now. July 11, 2013. Retrieved August 16, 2013. 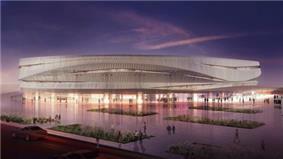 ^ "Forest City's New York unit wins contest to redevelop Nassau Coliseum". Crain's Cleveland. August 15, 2013. Retrieved August 16, 2013. ^ Fornabio, Michael (August 15, 2013). "Despite relocation speculation, Sound Tigers remain committed to Bridgeport". Connecticut Post. Retrieved September 26, 2013. ^ "Billy Joel set to be the final act at Nassau Coliseum". Associated Press. Retrieved 28 April 2015.